This tastes really good with shrimp or drizzled on eggs. 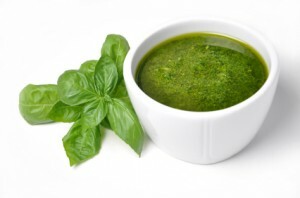 Traditional pesto uses pine nuts, but pumpkin seeds give a nice change of flavor as well as a good source of zinc. Place the pumpkin seeds in a pan and turn the heat to low/medium. Slowly move the seeds around with a wooden spoon until they are toasted. Add all the ingredients to a blender and blend. Add more salt if desired. You could also add parmesan for an even richer pesto.